April 26--"I'm glad I'm not responsible for this," I thought to myself. So we had the meeting with all the key players, and at some point, someone asked, "Who's responsible for this?" The room was silent, and pretty much everyone gazed off in the distance. You can probably see where this is going. I volunteered to coordinate the project. It really only needs that--someone who can coordinate it and make the calendar work. I'll have to spend some time between now and summer getting it in shape, and doing some teaching over the summer when I'm not in Thailand. I will also have to develop about 24 hours worth of online content, which we will be able to also use down the line in our own semester. In exchange, I will be released from some stuff in the fall. I really didn't want to be responsible for it, but someone had to step up. I remember thinking at the time I took this job that I would keep my head down and cruise into retirement. I'm taking a picture for my sister this evening, of her dharma group. She's pretty anxious that it turn out well, and has sent me a flurry of texts about it. Now she has me anxious about it. I hope the light is ok. I'm about 75% through The Last Picture Show and thinking about what to read next. I don't want to read the sequel yet--I like to put some space between one book and the next by the same author. Maybe even a different genre altogether. I have to finish my portfolio soon. It is due Saturday. I went over to the photo lab yesterday and printed up a couple more pictures. One turned out great, but the other one is kind of oversaturated. The professor said "It's perfect for a dark room!" 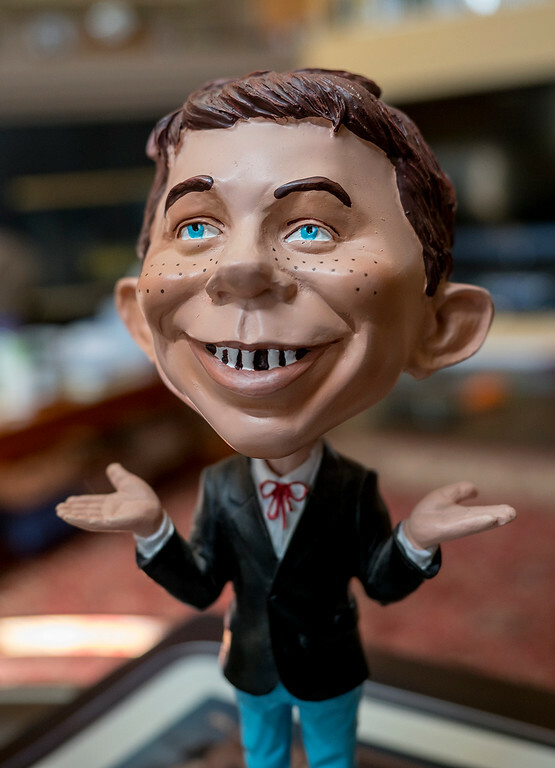 I don't have any pictures with me, so I am leaving you with one I took the other day of Alfred E. Neuman. Malida was using him for a photo project and I took a few shots, just because. I think I need to bring him to work, just to remind me.